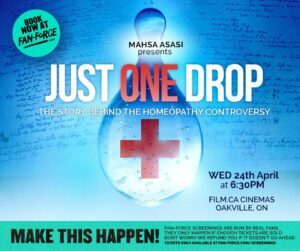 Just one drop: a documentary film about homeoapthy is coming to Oakville! Home > Blog > Just one drop: a documentary film about homeoapthy is coming to Oakville! Just One Drop tells the little known story of homeopathy: the most controversial system of medicine ever invented. Homeopathy is a specific form of medicine that uses minute doses of a highly diluted substance that stimulates the body to cure itself. To many, homeopathy seems purely a placebo effect or worse, a form of deception or quackery. Yet, homeopathy has been around for over 200 years and is used by millions worldwide. The film explores the controversy, dispels myths and misconceptions, and asks whether or not homeopathy been given a fair shake. This screening will be a great opportunity for every one specially for those who are interested in knowing more about the most controversial system of medicine which is homeopathy. the film is attractive and informative both for followers and skeptics of homeopathy! please book your tickets soon and that would be great to invite your friends to this fun movie night! There will be a question and answer session by Mahsa Asasi at the end. looking forward to seeing you there and please share this with your friends and family! Learn How To Build Your Own Natural Pharmacy at Home!